Guests will be picked up in New York and New Jersey in the early morning. From there we will travel north into Upstate New York. During the summer, we will drive to the Thousand Islands, where we will take a Boat Tour of the area. When it is too cold for the boat tour to run, we will instead visit the Secrect Caverns. The Big Apple, The City That Never Sleeps, The Cultural Capital of the World… whatever you call New York City, its impact on worldwide culture and business is undeniable. Seeing this famous metropolis is something no one ever forgets! Available in Summer only till 11/12/2015. Tour goes to Secret Caverns during winter. In the morning we will make our way to Niagara, NY, where guests will have the chance to ride the famous Maid of the Mist (or the Niagara Falls Jet Boat) up close to the falls. There is also the option to see the Adventure Movie (winter), Thundering Water Cultural Show (summer), or take an In-Depth Tour of the area. at the Niagara theater. From there, we will return to the New York area. See “Departure and Return Details” for pickup and dropoff information. Admission (Optional): Adult $18.25; Child (6-12 yrs) $10.65; Senior (Over 62 yrs) $18.25|Opening Hours: Daily May 1 – Nov 8 9:00am – 4:00pm|Duration: Approx. 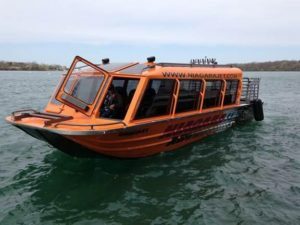 20 Minutes Seasonal Jet Boat Ride These exciting boat rides take passengers on a thrilling trip down the Niagara River! This 45-minute round-trip ride zooms through the Niagara Gorge, and even takes passengers to the famous Whirlpool rapids, all of a custom-built jet boat. Admission (Optional): Adult $61; Child (4-12 yrs, Children under 4 yrs are not allowed to ride.) $51; Senior (Over 62 yrs) $51; Senior (Over 62 yrs, Start from 4/1/2016) $61|Opening Hours: Daily 8:00am – 5:00pm, Times Vary|Duration: Approx. 45 Minutes Winters only. Niagara Falls Adventure Movie This movie, which guests will view on an impressive 45-foot-wide screen, tells the history of human interaction with the falls, focusing largely on the “daredevils” who have crossed, boated, and even jumped off them. Winters only. Admission (Optional): Adult $12; Child (3-12 yrs) $8; Senior (Over 62 yrs) $9|Opening Hours: Daily 10:00am – 4:30pm, Time vary seasonally|Duration: Approx. 45 Minutes Summers only. Thundering Water Cultural Show Niagara, like many impressive wonders of nature, is a sacred place for the local Native American people. This show uses dance as a storytelling medium through which to showcase the impact that the falls have had on native culture. 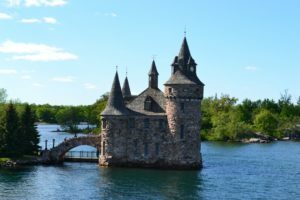 Admission (Optional): Adult $25; Child (3-12 yrs, including $13 of the Old Fort Niagara admission ticket) $15; Senior (Over 62 yrs, including $13 of the Old Fort Niagara admission ticket) $22; Tickets to Old Fort Niagara & Whirlpool State Park included.